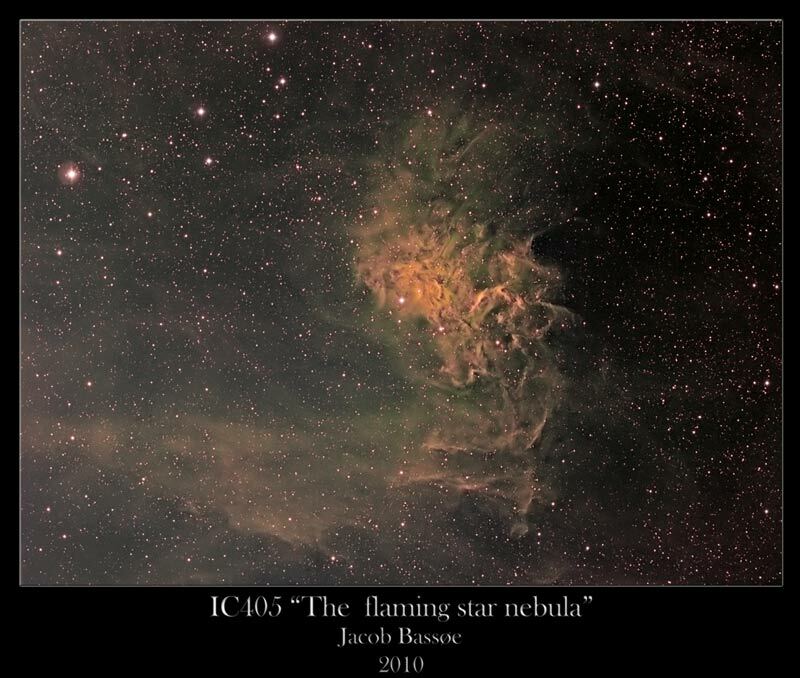 IC 443, the Jellyfish Nebula, a galactic supernova remnant approx 5,000 light years distant in the constellation Gemini. 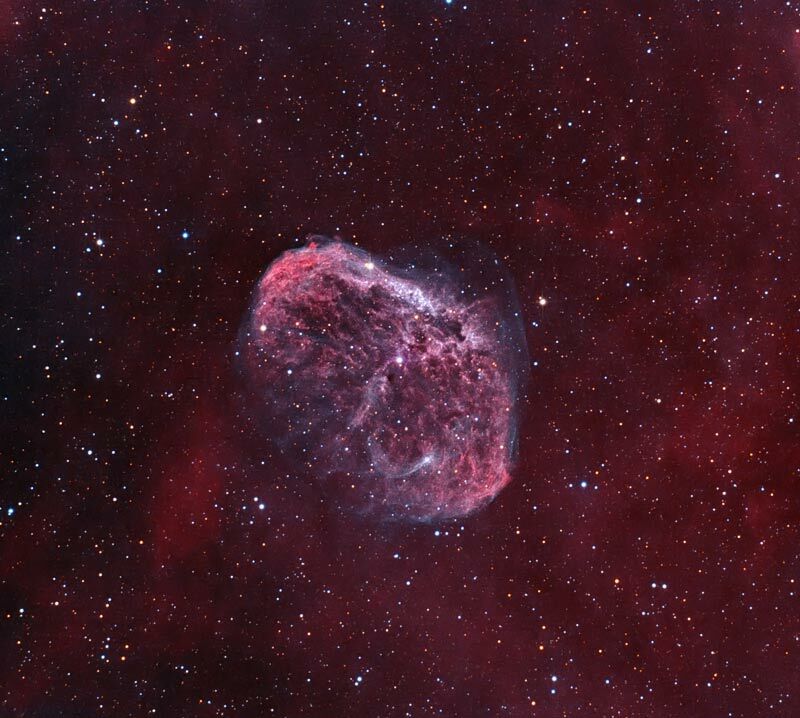 Imaged over 4 nights on Jan 12-13-14-15, 2008, with my FSQ106N and ST2000xm (Astrodon Filters) riding on a Takahashi NJP. 200 minutes of Ha was used for the luminance, 100 mins of SII for the red channel, 200 min of Ha for the green channel, and 100 mins OIII used for the blue channel (all unbinned, 20 min subs). Total exposure was 6.6 hours. 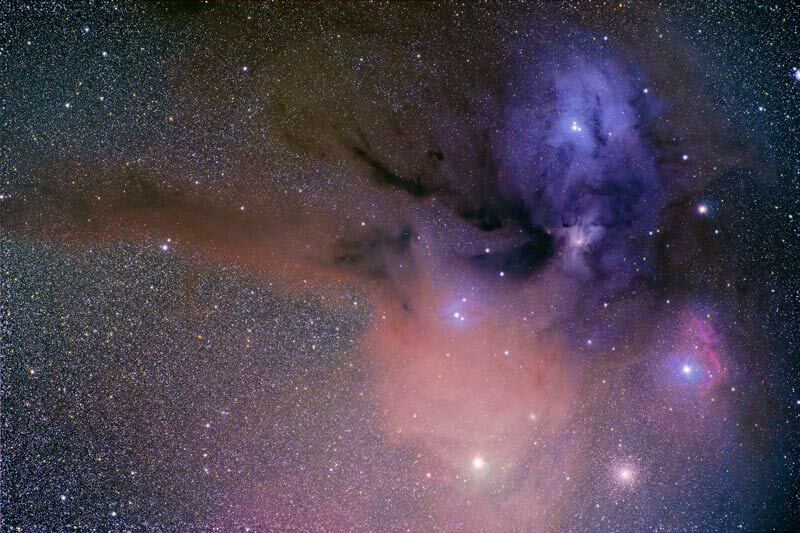 Here is Rho Ophiuchi Nebula IC4604, IC4603, clusters M4 and NGC6144 next to supergiant star Antares. 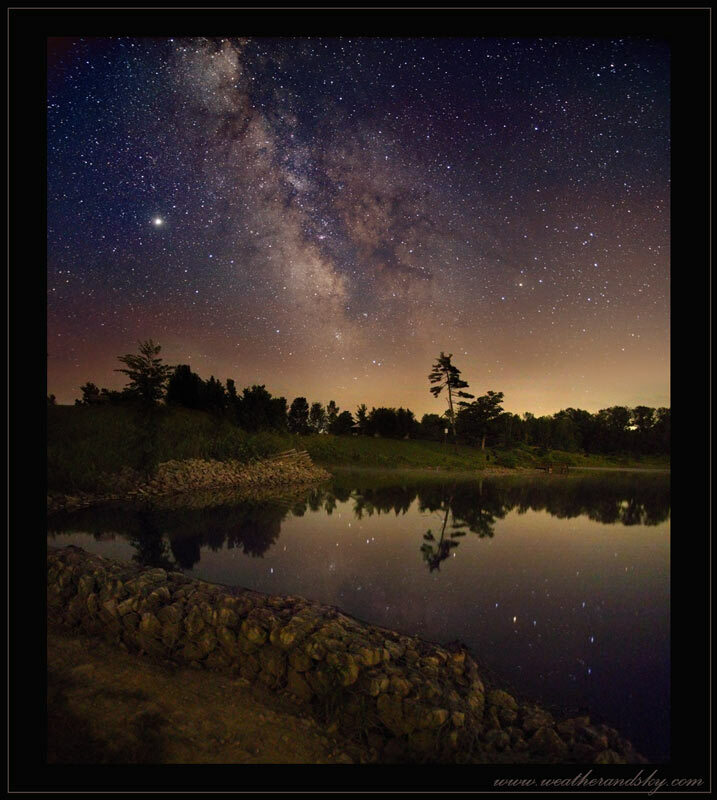 On July 5, 2008 I had the pleasure of observing and photographing the stars at a local conservation area and dark sky site in Binbrook, Ontario, Canada. I imaged this scene with an unmodified Canon 40D, Sigma 17-70mm lens (17mm @f2.8) and standard camera tripod with no tracking. This is a stack of 15x20sec exposures @ ISO 800 on the Milkyway down to the tree line, and another single 20sec exposure on the rest of the landscape below to create a two frame composite. Stacking was done in Deep Sky Stacker and processing was done in PS with layers. I was really lucky that the the water was beautiful and still enough so that the stars casted a nice reflection in the water. 24 exposures from 1/1600s up to 1/5s at 1/3rd stop interval with some frames missing due to movement. The last and longest exposure was made when the Diamond Ring was already on its way. Taken from Farnsworth Ranch AZ on Oct. 25th 2008. Final processing in Photoshop 6.0, noise reduction with NEAT. 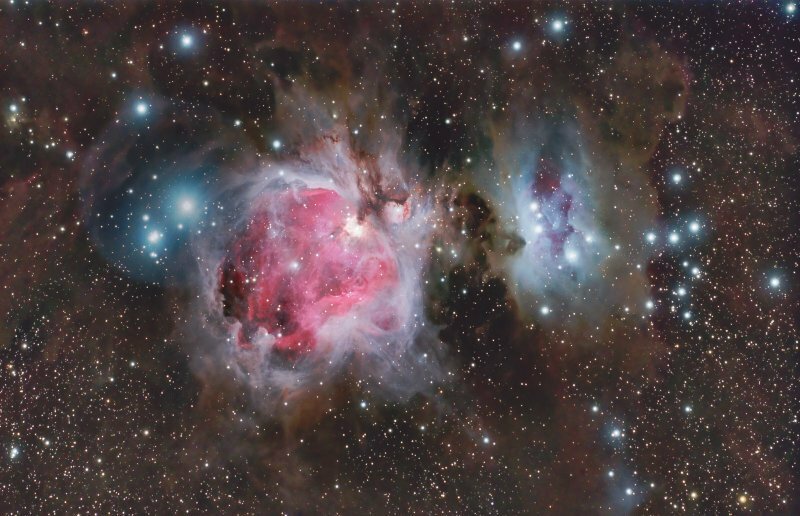 Here is my M42 taken from Rancho Venado in the Texas Hill Country. I tried to go deep and pull out alot of the surrounding faint dust. I combined different exposures to protect the trap while pulling out the dim stuff. 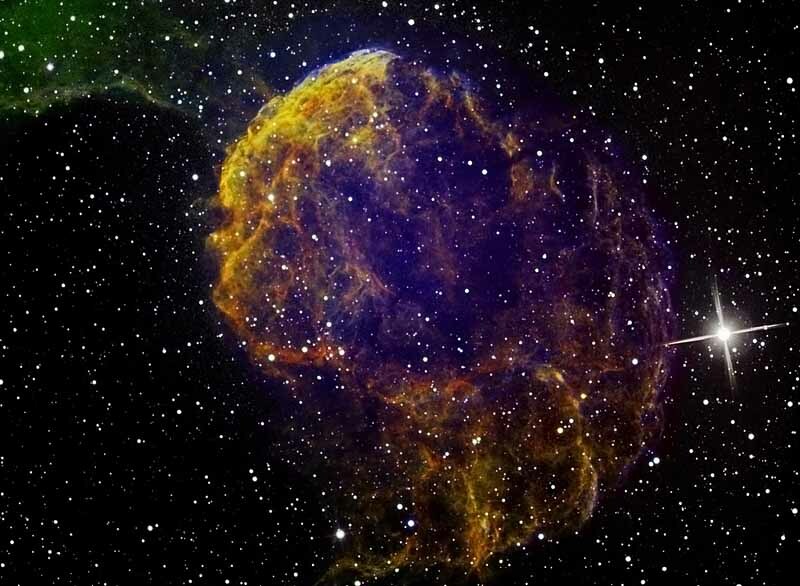 Supernova Remnant Sh2-240 in the constellation Taurus. Also called Semeis 147. 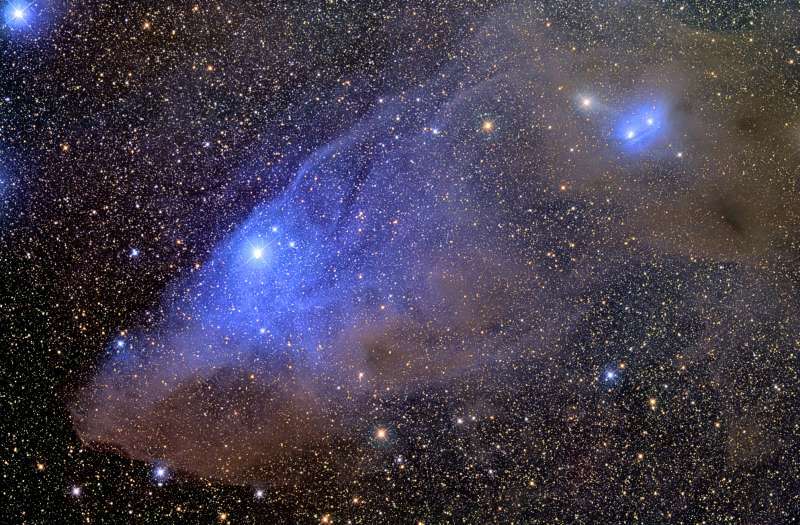 There is a rapidly pulsating neutron star inside of it that is thought to be the remnant of the star that caused the catastrophe. 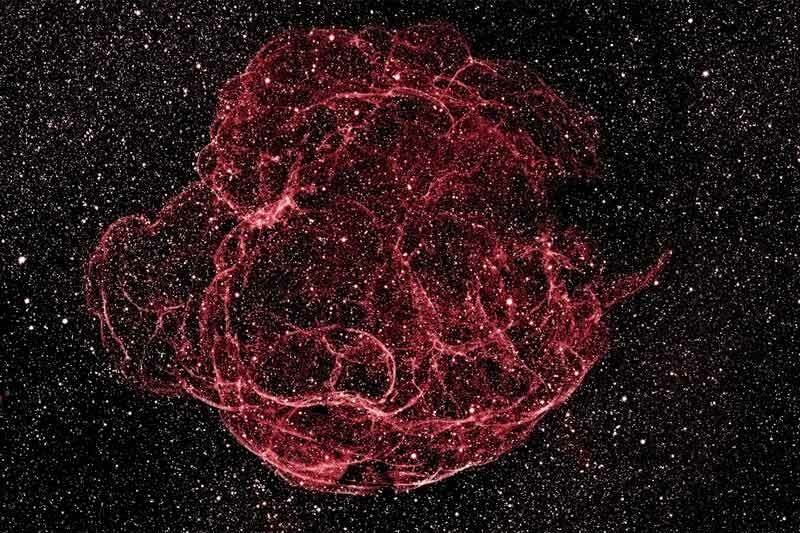 One of the dimmest objects in the night sky, this supernova remnant requires long exposures to capture it's wispy filaments. It is over 3 degrees wide, or about the width of 6 full moons. I used a 300mm camera lens to cover that wide field of view. With my best background levels getting within 10 ADU of the dimmest signal, imaging this object led to an education in the minutiae that degrade images. Nearby lights and lower altitude subframes led to slightly higher background levels and tossed frames, imperfect focus and wind gusts caused reduced S/N and FWHM and some more tossed frames. I used the best 9 out of 18 subframes. Tuesday night January 13th in very still air at 33 degrees F, yet poor seeing conditions, I decided to observe the moons spectacular terminator line with my 10.1" f/4.5 Newtonian and render this impressionistic and somewhat accurate pastel of the moons terminator line and as it was low and ‘warmed in color’ by the atmosphere. A 32mm Plossl was used for the general whole moon and a 12mm and 9.7mm for medium close-up details although the bad seeing (5/10 ? )did not allow much magnification. A spectacular phase it was! I spent about an hour from Jan 13th 11:45 PM PDT till 1 AM Jan 14th roughing in the terminator and other key details, then retreated to indoors with use of a several digital photos I took through the eyepiece with a 9.7mm Plossl for close-up and 32mm for wide field for reference to recheck positions of and fill in the mare and other general surface features. As Saturn was a few degrees above left of the moon I decided to add it in here, albeit a little out of distance scale from the moon yet showing the poor seeing conditions, I could barely make out Titan to the planets left, it is to accurate scale in apparent size to the live observation of the moon with a 32mm plossl at low power. The paper was not what I would have preferred, a 19" X 25" Strathmore in rich blue with embossed ridge, my last available sheet. An undesired ridge-line shows through the surface. The moon was sketched at 15 inches diameter with various pastel chalks and mostly kept in the warm golden range of colors due to the appearance of it rising low in the atmosphere. I photographed the pastel image today in daylight for accurate pastel color representation. 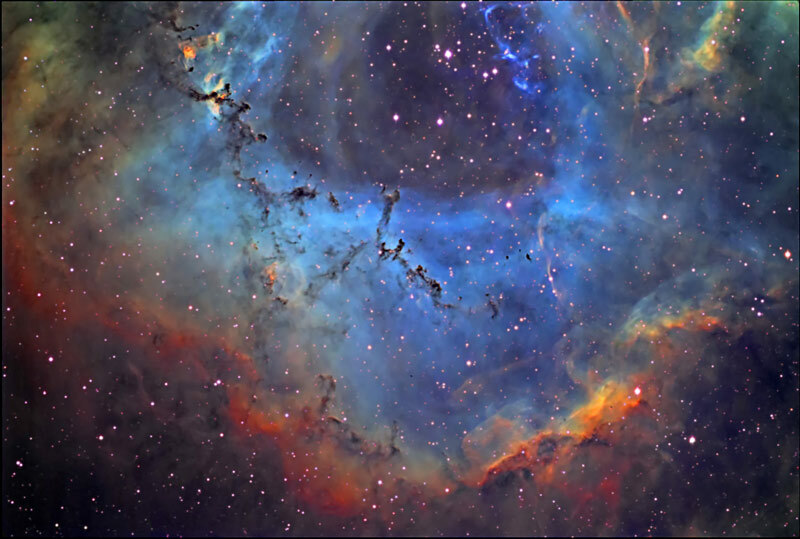 "Time Tunnel" inside the Rosette Nebula (Narrowband color). 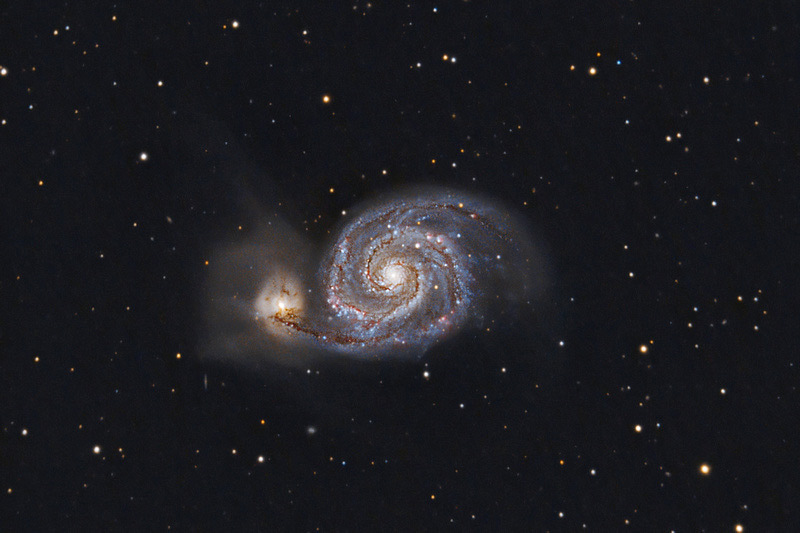 Imaged with my TOA130 and ST-10 XME and NJP Temma mount. 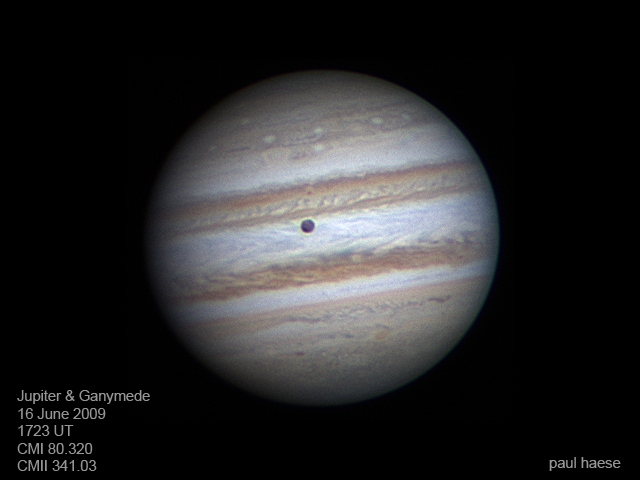 Imaged on January 30 and 31, 2009 from Redlands, Ca. (Ha)SHO of 60 minutes unbinned with each filter. 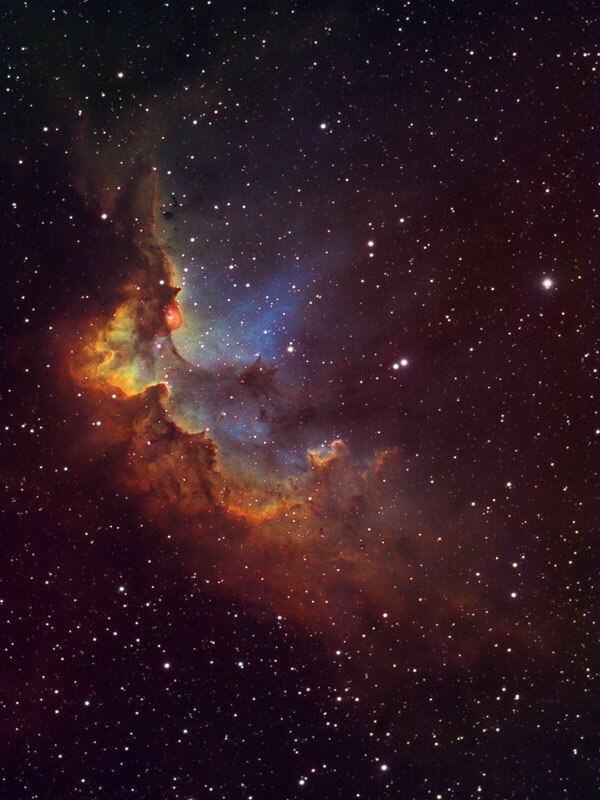 Image was taken during 13 observing nights in March/April 2009. 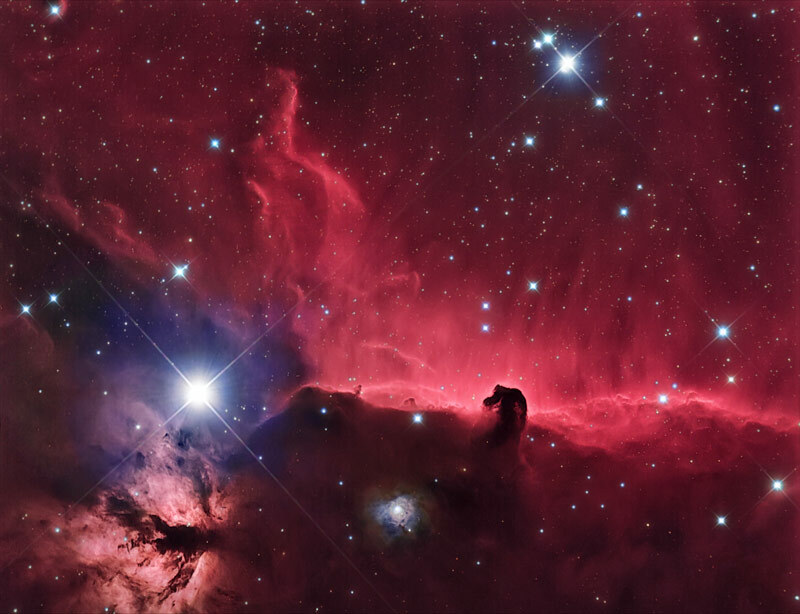 34x2min @ISO200 unfiltered RGB for color stars field and "pseudo-continuum" substraction. 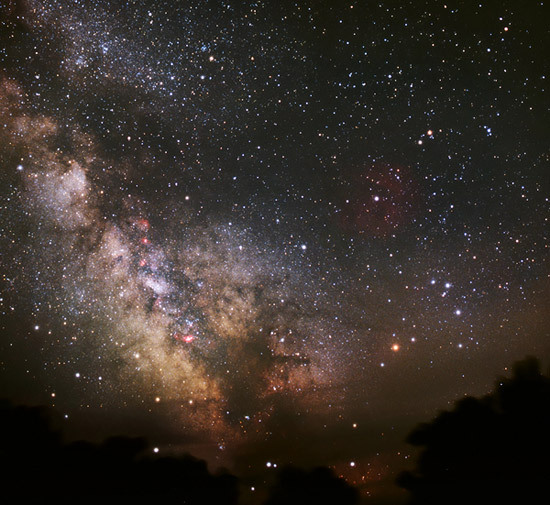 Light-polluted urban sky. About 4.0m visual limit. About 30% of h-alpha frames (10min subexposures) taken under the Moon. 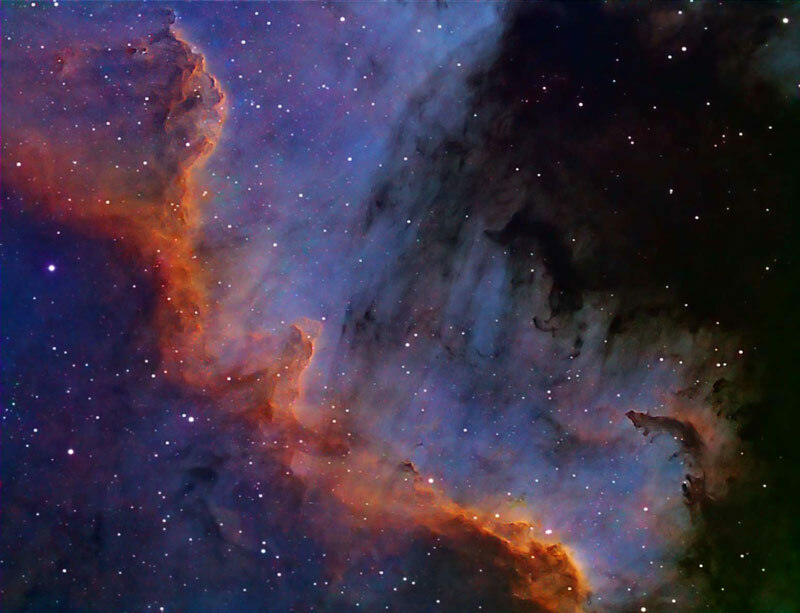 Taken with peltier cooled C14, Astronomiks type 2 RGB filters and Lumenera Skynyx 2-0 Camera. 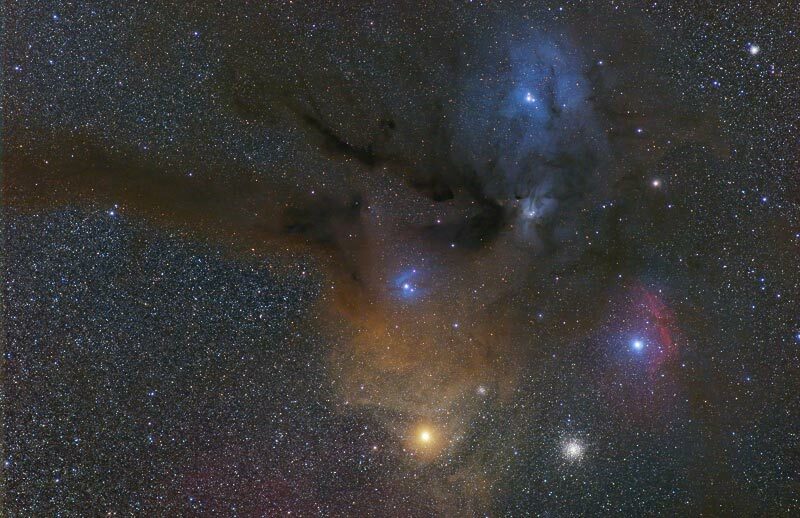 Antares and Rho Ophiuchi region. At Crimean_Astrophysical_Observatory, during "Southern Nights 2009" amateur astronomers festival. Iris for calibration & stacking, and Photoshop for post-processing. Self-processed in Jobo CPE-2, Unicolor Rapid E6 chemistry, +2 push-processed. 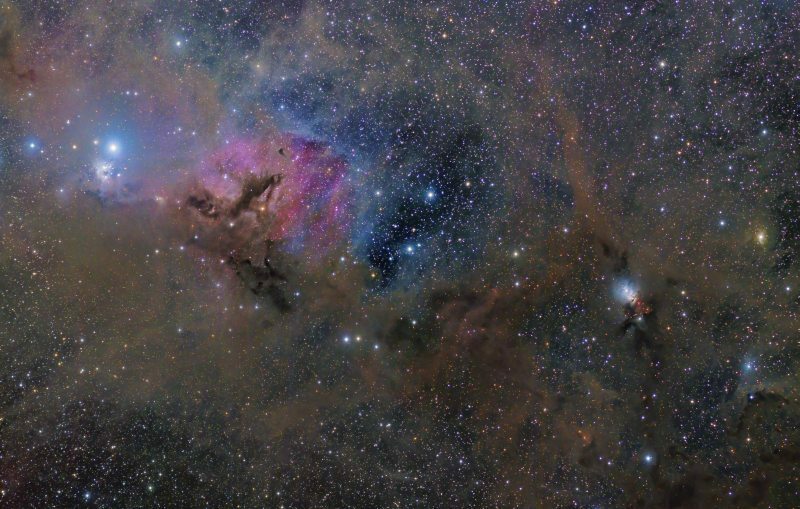 This wide field in Perseus stretches from IC348 to NGC1333 (with lots of dusty stuff in between) taken at Okie-Tex. Stacked and calibrated in CCDStack. Deconvolution with a CCDSharp, 30 iterations. This was the largest pastel of the near full moon I have produced as yet. It was done over two nights for a total work time of approximately 4 1/2 hours through the eyepiece of my 10.1 inch Newtonain last July 8 ~ 9, 2009. It was sketched onto 22" X 30" black Stonehenge 100% cold pressed cotton pastel paper. The moons disc was rendered at 16 inches in diameter. 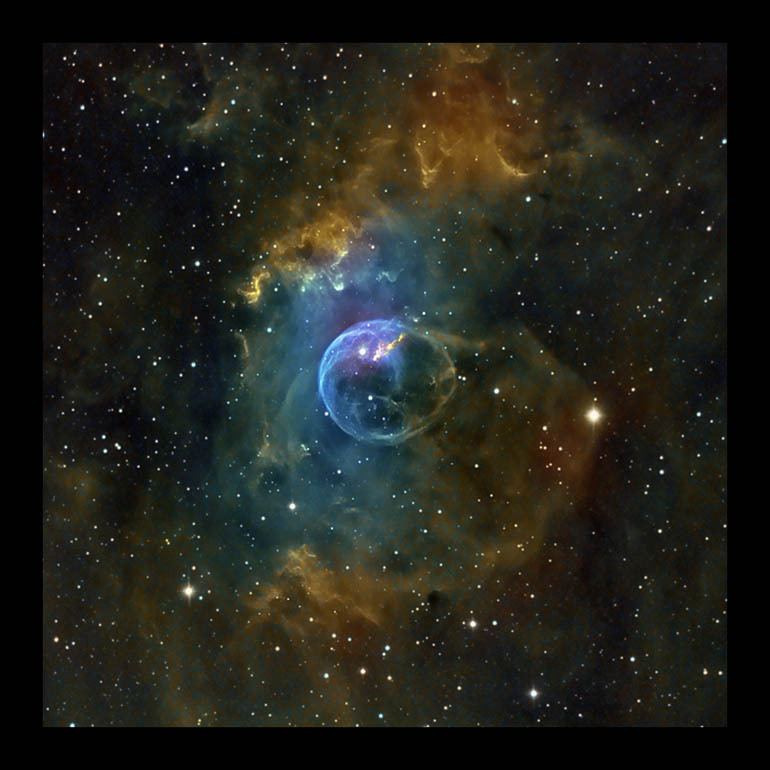 Software : EZCap, Nebulosity 2, Photoshop SC3.